Tested this on Air 1; worked well and easily. I'll echo those sentiments, it feels good to see people up on it, happy about it, in and all around it !!!! Is the 3D Touch just for aftertouch and not for velocity? Does any one know? If so it seems a bit of a wasted opportunity, no? Yep. Exactly what @Seangarland said. I think it's the quality thing - not anything else. 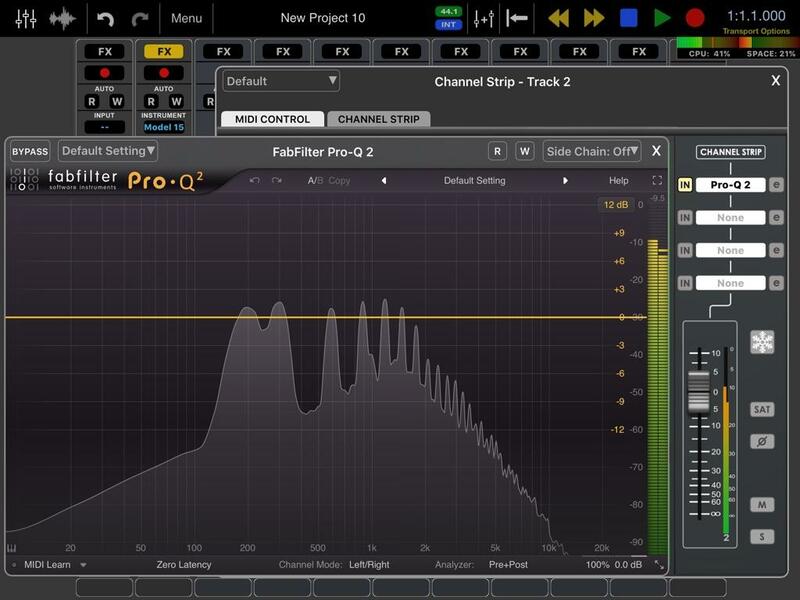 On Econ mode without any other Auria Pro plugin, M15 general preset patches running around 35 - 50% CPU. Note: All observation with Auria Pro red button off on track. Having now seen the review from Doug at TSTR, I can see and hear the quality of this app, fabulous for those who are into that classic Moog sound. It was also apparent to me that the specifics of what it does - the type and range of sound it emulates - is not something I'd use more than the IOS synth collection I already own. So Moog are probably right with thier strategy, as sonic dabbler's like me, with just a casual interest, aren't going to be easily tempted. Thus pitching to and pricing for those who revere the hardware version, properly appreciate this app and want its specific focus, makes sense. where is the Doug TSTR review? Got a link? anyone already tried some (Filter)FM stuff (audiorate) with it?That's were many"virtual analog"fail to deliver but it's especially interesting with a modular synth. Model 15 delivers fine with audiorate stuff. I mean, watch your volume obviously, but it works and sounds great. Actually, it's really freaking great, and seems better than that other software moog modular, though with less modules. 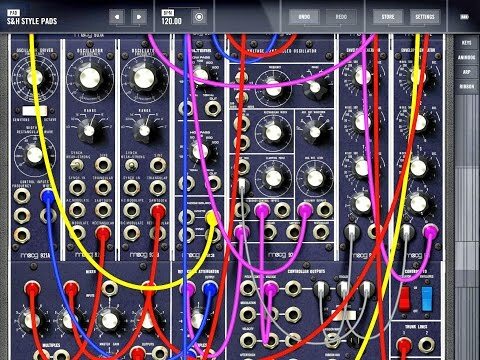 For those new around here, what's 'that other software moog modular' ? I believe it's aimed at anyone who wants to add a high quality and unique voice to their sound palette, or one who is interested in learning modular synthesis on the virtual equivalent of a real Moog instrument---or both. The pricing probably reflects the work that went into the making of the app and what the developers think is appropriate for the iOS market. It's a groundbreaking tool on iOS that doesn't lend itself to the pricing of a professional app on the one hand, and a cheap impulse buy for those who don't really want it on the other. I guess in order for an app to make use of the metal technology it needs to be programmed from the beginning like this? So......animoog for example couldn't be retrofitted with metal right? I'm wondering if any other music apps make use of metal aside from M15. Most likely referring to the moog modular vst by arturia. Keep in mind that one is 15 years old now (at least). I haven't followed out but did arturia redo anything on out audio wise since its release? I just got paid for a gig that I had forgotten about so I think I'll be getting this app soon. IT WAS THE APP FAIRY I TELL YOU! As far as I know there aren't any, not unless you were thinking of Pulse Code Inc app, Modular Synthisis? I got the free soundpack via Facebook. Had to switch on the setting to allow it then disabled it. Whatever the hell that does. 20 presets, some very similar(at first play through anyway), seems decent enough for a free pack. So.., ok,...thanks again! pretty sure its arturia's modular v - but its desktop only. Ok, thanks. I thought it did velocity in the Roli Noise, but I could easily be wrong. I have an iPad 4 which is unlikely to be replaced until 2017. However, my iPhone 6 can take it. The question is, is it worth getting only for the phone? Yes, if you're happy to take samples from it on your phone for use in your tracks. Depends on your workflow of course. Just checked Noise on 6s and the yellow circles (velocity) are definitely bigger or smaller depending on how hard I tap. Reacts nicely to velocity on my 6S too. Are you sure it's not something else in the roli app?It is possible to"fake"velocity,i've seen this in some (few) apps before and i'm not talking about your fingers position (top/bottom of keys),i mean something like the apps register via microphone how"loud"your tap is or the more of your finger is on the screen (which will be more the harder you tap),the more velocity...?Sorry,can't say it better in english The roli description says about 3D touch:for pressure and movement.No mention of velocity...in other words,if velocity works in the roli app it looks like it should work on devices without 3D touch as well.And in apps that are not optimized for 3D touch. When I try with Noise on my iPad (big pro), the yellow circles stay the same.